“Los Angeles is going places, and LAX is helping us get there,” said Mayor Eric Garcetti. On Sept. 6, BOAC had approved an Early Works Agreement with LAGP not-to-exceed $5 million, which allowed for pre-construction activities such as hiring, soil testing, engineering, and further design of the ConRAC, all of which are crucial to maintaining the project schedule. On Oct. 18, BOAC unanimously approved the contract. 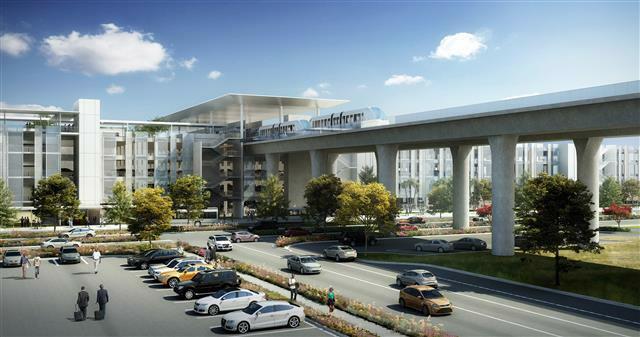 “The ConRAC facility will transform the rental car experience for travelers at LAX and make it easier for them to get out and explore all that Los Angeles has to offer,” said Councilman Joe Buscaino, Chair of the LA City Trade, Travel and Tourism Committee. Southern California represents the largest rental car market in the world and LAX is the second-largest rental car airport market in the U.S. behind Orlando. On average, LAX rental car companies rent an average of 265,000 vehicles per month. The ConRAC facility will feature 6,600 ready/return parking stalls, 10,000 idle vehicle storage and 1,100 rental car employee parking spaces. The approximately 5.3 million square foot facility will be built in an area bordered by Aviation Blvd. on the west, Arbor Vitae St. to the north, La Cienega Blvd. on the east and the new 98th St. extension to the south. The facility will be connected to the APM, which will eliminate the need for rental car shuttles to have access the terminal loop. With the removal of rental car shuttles, LAX will see a reduction in vehicle traffic and passengers waiting to board curbside at the airport. As part of their proposal, which had the lowest ultimate cost and the second-highest technical score of the four teams that participated in the bid process, LAGP committed to delivering an environmentally friendly project and developing opportunities for local small businesses, creation of good-paying career jobs and fostering economic growth. Some of their most impressive commitments were to ongoing training and development for their entire workforce throughout the 28-year contract term, including a fund to help veterans complete their four-year degrees. The ConRAC will be built using a Public-Private Partnership (P3) contracting model. LAGP will be designing and constructing the facility and will also be responsible for operating and maintaining it for a 28-year period. This incentivizes the construction and operating systems to be built to last. The APM system is also being built with this contracting model. The ConRAC will be operational in 2023. LAGP is led by Equity Members Fengate Capital Management Ltd., PCL Investments USA, LLC and MVI Finance LLC. The Lead Contractor is PCL Construction Services, Inc. The Lead Designer is PGAL, Inc. and AC Martin Partners, Inc. Collectively, the LAGP team has extensive experience designing, building and operating nearly 30 ConRACs domestically and internationally, including the Atlanta-Hartsfield RAC facility, the Boston Logan Consolidated Rental Car Center, and the Nashville International Airport RAC facility. The ConRAC is a major component of the LAMP, which also includes the APM system, Intermodal Transportation Facilities (East/West) and associated roadway improvements. For more information on the LAMP project, visit FlyLAX.com/ConnectingLAX. LAX, the fifth busiest airport in the world and second in the United States, was named in Skytrax’ 2018 top 10 U.S. airports. LAX served more than 84.56 million passengers in 2017 and offers 737 daily nonstop flights to 100 cities in the U.S. and 1,386 weekly nonstop flights to 88 cities in 44 countries on 73 commercial air carriers. LAX ranks 13th in the world and fourth in the U.S. in air cargo tonnage processed, with more than 2.2 million tons of air cargo valued at over $101.4 billion. LAX handled 700,362 operations (landings and takeoffs) in 2017. For rel="noopener noreferrer" more information rel="noopener noreferrer" about LAX, please visit www.flyLAX.com or follow on Twitter @flyLAXAirport, on Facebook at www.facebook.com/LAInternationalAirport, rel="noopener noreferrer" rel="noopener noreferrer" and on YouTube at www.YouTube.com/laxairport1.